NetEase, World of WarCraft's China operator, has just started pre-order sales for a limited edition WoW: Mists of Pandaria Mahjong set. The set looks like two of China's biggest names in gaming have combined and spit out a baby. 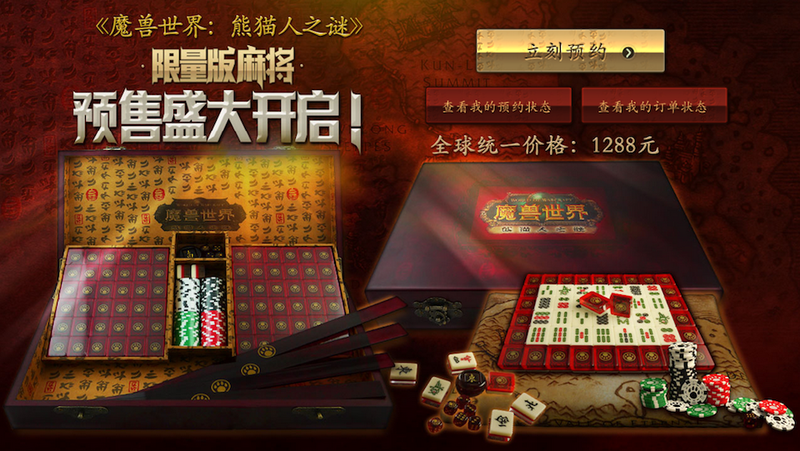 According to NetEase's homepage, there will only be 1000 of these special Mahjong sets available world-wide. No clue what that means for western players, but so far, the set's only appeared to be for China. Each set will cost 1288 RMB, or about $209. The set is a fully playable Mahjong set, tiles, table mats, dividers, chips and all. Everything is decorated with WoW-esque decals, and a table mat that features in game maps. The whole set comes in a nifty wooden case. So far, many online commenters have questioned the pricing of the set, saying it's too expensive. Other comments were more about its availability; they were concerned that if the set was truly a limited edition for the whole world, there would be too few to go around. One Chinese gamer asked if "foreigners play mahjong at all." Mahjong is one of China's oldest tabletop games around. Played with a set of 136 tiles split between four players, the game can be played either for sport or for money. Despite the ban on gambling in China, Mahjong is still played for money in various locations across the country. It'd be interesting to see if anyone actually uses the WoW set to play Mahjong. Western players can attempt to pre-order this set at NetEase's official WoW Site.